Just a quick thank you to everybody who has donated so far. If you have donated and not received an email from me, please let me know. I’m glad to see that you got some donations 🙂 I would donate myself but I’m in a bit of economy problems at the moment so I need every cent I can get. I’ll add some incentive to reach that $300 goal quickly. If the donations reach the target $300 by June 30th, I’ll offer up two Steam games in a lottery draw for people who donate (or have already donated). Two games, so two winners. 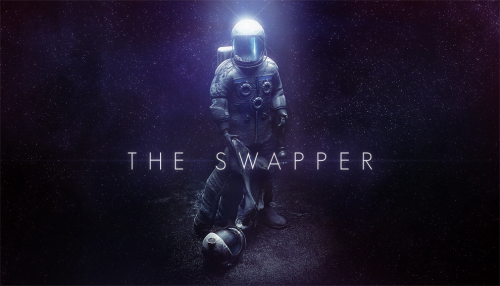 I have played both these games, and both are excellent, atmospheric puzzlers: The Swapper and Antichamber. An atmospheric, clever platform puzzler. The main mechanic is using a gun (the swapper) to clone yourself, and then switching your consciousness to the clone (hence swapping). It’s clever and the mechanic itself ties into the narrative. Most of the scenery was molded in clay and photographed, which gives this game a unique, beautiful feel. A bright, clean first person puzzler. There are no weapons but you do get guns to manipulate blocks to help you solve puzzles and reach otherwise inaccessible areas. Been a while since I been here, been real busy. Anyway, I finally am in a position to donate. How do I donate? Just click the Pitch In! button on the orange box where it says Donate Here. If you don’t see the orange box then I think Flash isn’t working in your browser. I’m also willing to donate, but I wonder how much of my intended 5$ will be left, as my account is in €? I’m new to Paypal, so what are the (hidden) costs with such a transfer? To my knowledge it’s completely free for you, but if you have any doubts, then don’t donate this year. Wait until you are very successful and wealthy, then make a donation. lol, we can all keep dreaming, can’t we? Money’s on it’s way, cheers! Anyway, the site has given me a lot more than $30 in fun over the years. Well worth it. I say it is a good investment to anyone who uses the site. All right! 111% to date, I have games to give out. I’ll wait until June 15th just in case there are any latecomers who want to donate and grab a chance to win one of the 2 games I listed above. Of course. Everybody is allowed to suggest ideas. Be aware though that there is often a big difference between what Players want to play and what Mappers want to map for in competitions. As you know, I’m a huge fan of Half Life 2 from 2004. I liked Ep1 ok, but not a fan at all of Ep2. And when it comes to the original HL2, you know my favorite two chapters: Water Hazard, and Highway 17. * Author can choose Water Hazard type map, or Highway 17 type map. So if author chooses HWY 17, it would be cliffs and beaches, and if it is Water Hazard it would be city canals, just like in the game. The whole map would not have to be drive time. Players might have to stop to solve puzzles, explore shacks, etc, just like in the game (so it wouldn’t be all “drive time”). I would ask authors keep it close to the HL2 formula. Since it takes a modder so long to make that type of map, I would give it 3 months. To make it worth while, I was thinking of a $400 first prize, and a $150 second prize! If I were to offer the money up, would something like this be doable? or is it just too much to make these kind of maps? The problem with Highway 17 / Water Hazard maps is that, by far, they are the least efficient designs you can build. Unless the player is driving up and down the road, you’re building out all these surrounding areas that players are just going to fly past and never see again. Also, 3 months is an extremely long time for a competition. And because Phillip only does one mapping competition at a time, everyone who is not interested in that theme would have to wait 4 months for the next one. True, which is why I would call for 3 months build time, plus large prize money, to make it worth while. Also, the map load problem was a big issue with the original Hwy 17 (HS), Water Hazard (WH)….because a player moves so fast there were areas in those two chapters that had map loads too close together (although Valve managed it pretty well). But since HL2, the author of Minerva has taught us a thing or two about map making to save map loads…by building them vertically rather than horizontally. Actually Valve did some of that (to a small extent) in WH and HS. So if canals and highways were “widely” zig zagged in a vertical/horizontal fashion but not too tight (as to destroy speed like in Ep2), that might work to give players 10 or 20 minutes of drive time between loads. And of course like I mentioned there would be times when the player explores shacks, boathouses, solves a puzzle, etc. I hear ya on the argument of build time JG, and you might be right, it might be too much to ask. I am just wondering if it is doable, and if the modding community here at Planet Phillip might want to take on such a challenge? Another idea I had was a “Black Mesa” competition. In this, the challenge is to make a Black Mesa mod…in other words, use the models from the new “Black Mesa” game and the Ep2 source engine of course, just like BM did. The draw has taken place and the winner and runner up will be contacted soon. Thanks to everybody who donated.